This week at the art galleries I was captured by Isaiah Ulloa’s work. His art was featured in a show titled “Labyrinth” which was a collection of works. The artists showcased along with Isaiah were Angel G. Franco and Juan Martin. Isaiah Ulloa had one piece that he made by himself, and then one that was a collaboration with the another artists. None of the pieces had titles which I appreciated because I was able to have my own thoughts about the art without being influenced. I loved the piece that was the collaborated piece. 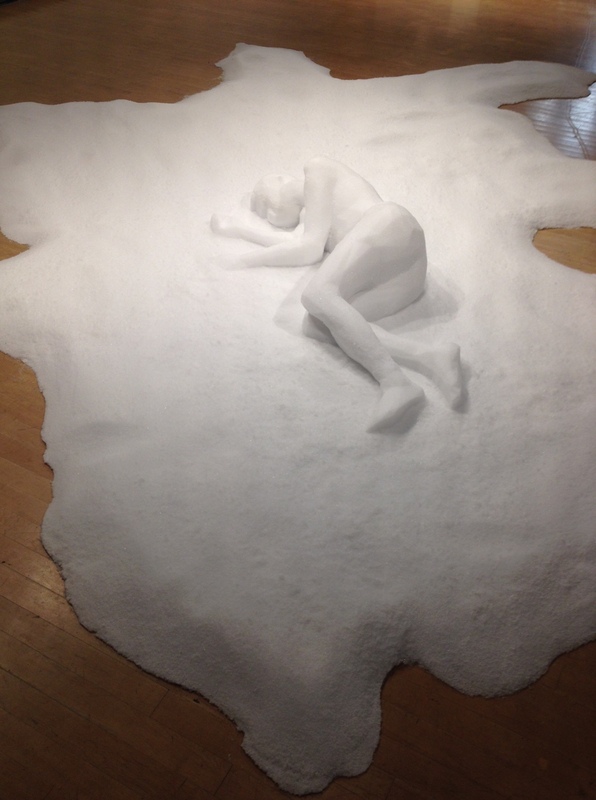 It resembled snow and had a mold of a body laying in the snow. After interviewing Isaiah, I found out that the mold was of his own body which was fascinating. The room that the “snow piece” was being displayed in was cold, and the sculpture actually seemed like it was made out of snow. The bright white and white mold reminded me of desolation, being lost, and isolated. It was super interesting learning about the process of how the work was created. The work took about a month to create after the planning process. The artists were inspired by technology and how it has progressed so much making so many things so easy. One of those things being art. Technology allows more to be made in less time. Isaiah’s body was scanned on a computer and then carved by a machine. The snow looking material is all foam. The artists used with 3D printers which I was intrigued by. I have heard so much about them but have no idea really how they work. After talking with Isaiah about how the work was made, I was fascinated by technology. There are both positive and negative responses to technological advances. I realized after talking to him that technological advances can be a really good thing for artists. They can aid in actually creating art and allow for quicker production. Posted in UncategorizedTagged #art110, francoulloamarti, IsaiahUlloaBookmark the permalink.